Successfully Added Mini Cell Phone KK1 - Quad Band GSM, 330mAh Battery, 0.66 Inch Display, Bluetooth, Full Numpad (Black) to your Shopping Cart. The KK1 is a mini cell phone that is no bigger than your thumb. At a mere 20 grams and measuring just 70x25x9mm, it is probably the smallest and most compact phone on the market. 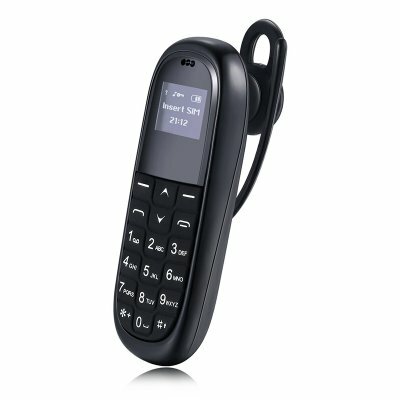 This mini cell phone has Bluetooth support so you can pair it with your headphones and slip it in your bag or pocket. Alternately you can use the provided ear clip and mount the phone over your ear. Operating on quad-band GSM frequencies you can enjoy wide global support from this mini mobile phone. With a 330mAh battery, you'll get around 3 hours of continuous usage time so even if you're a chatterbox you'll have enough power for a night out. So if you don't want to be weighted down by a large heavy phone and want to keep connected through the day or on a night out then this mini phone is the perfect solution and will slip into even the smallest pockets or bags. This mini cell phone comes with 12 months warranty, brought to you by the leader in electronic devices as well as wholesale mobile phones and cool gadgets..